Intense Nurture Antioxidant Elixir: Atmospheriques is de Mamiel’s pollution-proof line of skincare, and these products are designed to ‘repair and protect skin from oxidative damage caused by environmental stresses we encounter everyday.’ This particular product is an antioxidant rich treatment that hydrates, refines, restores and protects the skin. I’ve mentioned in a previous review that ‘elixir’ tends to be a confusing term in skincare because different brands use it to describe completely different product categories (Yuli uses it to describe their toners, Kypris their oils, Julisis their serums and so on…). The elixir in this case is a treatment serum with an unusual sap-like consistency (traditional French pharmacy brands would have used more accurate terms like lait/milk or fluide to describe its texture). The milky serum is easy to spread and half a pipette is enough to cover the whole face and neck. It feels cooling on the skin and absorbs without any stickiness or residue. It has a churchy/floral/earthy scent that reminds me of other de Mamiel products. I have been testing a lot of treatment serums lately, and I honestly didn’t expect this serum to be one of the best. It instantly wakes up my skin and revives it by making it look fresh, dewy and plump. Even though I’ve only used it for just over two weeks, I’m seeing a difference in the texture and tone of my skin already. I love that I can use it both am and pm. Based on info provided by Jeannie Jarnot of Beauty Heroes, the reason this product works so well is because it contains both first and second-generation antioxidants (1st generation – Ferulic Acid (from rice bran) and Superoxide Dismutase (a by-product of biofermentation); and 2nd generation – Malachite Extract and Quercetin (also a by product of biofermentation)). The different antioxidants interact at different phases of oxidation to prevent cellular damage and keep skin bright and glowing. Most coconut oil-containing products break me out, but the fractionated coconut oil in this hasn’t broken me out or irritated my skin in any way. The only thing I don’t love about this product is the dropper packaging – the serum is way too thick for this and it’s a struggle to dispense the right amount (a pump, in my opinion, would be a much better alternative). In typical de Mamiel fashion, the ingredient list is dizzyingly long, but the brand claims that each ingredient is carefully chosen to serve a specific purpose. Exhale Daily Hydrating Nectar: I’ve owned two bottles of this product in the past, and it’s one of the lightest sunscreen products I’ve used. The US version of this product (and the one featured in this month’s Beauty Heroes box) doesn’t mention that it contains SPF 30, but it’s exactly the same formula as the one that bears the SPF 30 stamp in the UK/rest of the world. I believe de Mamiel is still in the process of applying for SPF registration in the States (this has been the case for at least the last year and half), and I hope they get it registered soon so they don’t have to continue packaging US products separately! Like ‘elixir,’ ‘nectar’ is confusing product terminology. In this case, it means a tinted emulsion/cream. I was worried about the tint before I purchased my first bottle, but it disappears into the skin without a trace and works on all skin tones (including darker tones like mine). It leaves no residue and provides a matte finish without drying your skin. I don’t really care for its scent (to my nose, it starts off smelling churchy/floral/earthy like most de Mamiel products and then dries down to a funky lentil-like scent); but scent is such a personal thing, and you may love it. I’ve been using this sunscreen on and off for the last 12 months or so, and it’s one of my top sunscreen picks. The sample size in the Beauty Heroes box is a great way to test if this sunscreen works for your skin type. Make sure you get this box before it sells out; it really is a good deal. 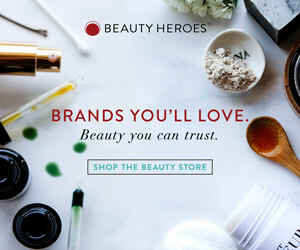 Sign up to Beauty Heroes now. © 2018 JustAskArjun. All opinions/views are my own. I accept press samples for review consideration, however, all products are treated with the same level of scrutiny. The Beauty Heroes links are affiliate links, and I earn a small commission if you subscribe using these links. Please feel free to use these links for your subscriptions/green beauty purchases to support my blog.